Make a table runner for your dining room table…Many options to use this technique. * table runners, placemats, tablecloths, bed runners you can even make a dresser scarf. For the beginners and already quilters. $35.00 fee.. supplies are extra.. Learn from beginning to end. BRING YOUR sewing machine, rotary cutter, ruler, scissors, seam ripper… Please purchase any items you do not have from Home a la mode. WE ARE HERE FOR YOU!!! 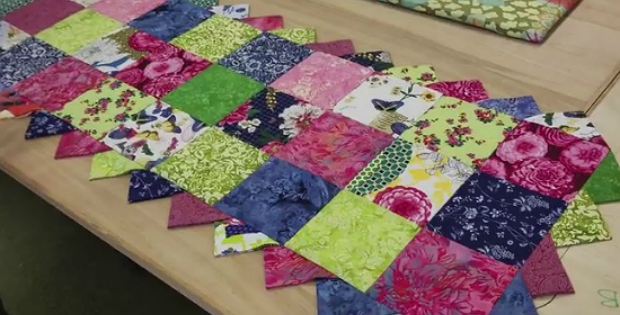 When you have finished sewing your blocks together.. we will help you bind your quilt. Anyone who has not completed in class… Gets a la mode classes!!! So you can come back and finish at your next convenient time.